US Ambassador to Israel Daniel Shapiro insists that diplomacy is key to regional peace - whether between Israel and the PA or with Iran. 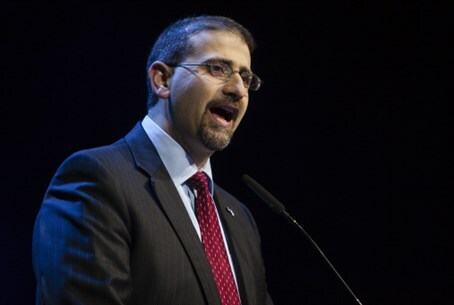 Ambassador Daniel B. Shapiro, ambassador of the United States to Israel, addressed the delegation of Presidents of Major American Jewish Organizations Monday, stressing that the US-Israel relationship is still going strong. During the conference, Shapiro addressed two primary topics of dissent between the two countries. He mainly focused on negotiations with Iran, and later answered questions on the direction of ongoing negotiations between Israel and the Palestinian Authority (PA). "I share the conviction of Secretary Kerry and President Obama that we urgently need to make progress on both of these fronts," he explained. "[Israel's] security, US and regional security - all depend on it." "We know that the possibility of a regime like Iran['s] possessing a weapon like a nuclear weapon is simply an unacceptable option," Shapiro stated. "It would pose an existential threat to Israel, it would start a nuclear arms race in the Middle East, and it would put in the hands of the leading international sponsor of terrorism a weapon that would give great, great additional power to terrorist organizations." Shapiro stated that since the agreement was formed between Iran and Western powers in January, Iran has "begun to eliminate the stockpiles of higher levels of enriched uranium, cease additional production of such uranium, dismantle some of the important infrastructure which makes enrichment possible, cease installing advanced centrifuges, ceased heavy work at the Arak heavy water plutonium reactor, and has provided international inspectors with far greater access and transparency than we've ever had before." Shapiro noted that discussions begin Tuesday for a "more comprehensive agreement" that could possibly be permanent. "Over the next six months, we and P5+1 will continue to implement limited sanctions relief, so long as Iran continues to fulfill its end of its obligations," he continued, noting that it might "provide an incentive" for a "more comprehensive" agreement. He also noted that the current sanctions relief was the driving factor bringing Iran to the negotiating table. Shapiro nonetheless stressed that if Iran does not keep ceasing its nuclear program according to the terms of the agreement, the US will halt all sanctions relief. Moreover, not only are additional economic sanctions on the table but all options - including a military option - are on the table. When questioned regarding the PA's ongoing incitement against Israel, Shapiro responded that the US views Abbas as a "peace partner" and even that Israel views Abbas as its "natural peace partner," yet also admitted that "the issue of Palestinian incitement has not gone away." Shapiro also referred to Abbas's meetings with Israeli students in Ramallah Sunday, and insisted that Abbas acknowledged PA incitement and that he said "it has to be dealt with." Shapiro continued that the US continues to raise the issue during the negotiations. "In various other ways, Abbas has demonstrated that he is a viable partner," Shapiro noted, contrasting him with Hamas. One of the questions after Shapiro's speech addressed the issue of Jonathan Pollard. Pollard has recently been subject of a high-profile campaign for his release, after being held in the US for more than 28 years on spying allegations. He was arrested by FBI agents in 1985 and held ever since. Calls for his release escalated since it was revealed in December that the US and UK have been spying on top Israeli officials, including Prime Minister Binyamin Netanyahu. Pollard was arrested on charges far less serious, critics noted, and slammed the Obama administration for "hypocrisy." The questioner asked whether or not Pollard would be released by Passover - the Jewish holiday of freedom - to great applause. Shapiro responded by giving a slight preamble over the "sensitivity" of the issue, then stated, "He committed a serious crime; he went through the American justice system [. . .]; he is serving the sentence he received from the court; and that's his status. He has the rights of any American citizen who's incarcerated to seek some form of clemency or other release [. . .] but I won't offer any predictions on what might happen in the future."